Ragmans Farm is a 60 acre organic farm in the Forest of Dean in Gloucestershire. 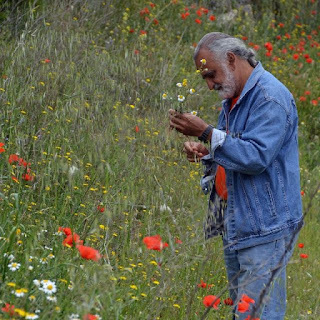 We use farming practices that regenerate the land, using permaculture as a guiding design principle. Between the three main enterprises at the farm – Ragmans Lane Farm, the Willow Bank and Ragmans Market Garden, we provide employment for about 8 people. Ragmans Lane Farm has eight acres of organic apples and we make our own brand of apple juice. We also host a series of courses throughout the year on land related issues. A course led by Jairo Restrepo in 2015 introduced us to a new philosophy of system health, based on building healthy soils. This had a profound effect on the farm, and led us to set up a full time research post to develop these principles for temperate climate agriculture. Our research manager, Juanfran Lopez, is half way into a three year programme and this blog is predominantly about his work here at Ragmans. Our research goal is to gain expertise in making soil amendment preparations. 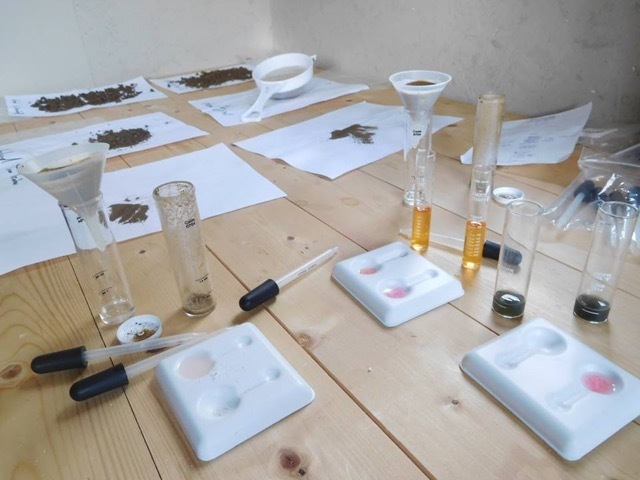 We will then measure the effectiveness of these biological techniques on system biology and mineral balance on plant-soil health and growth. 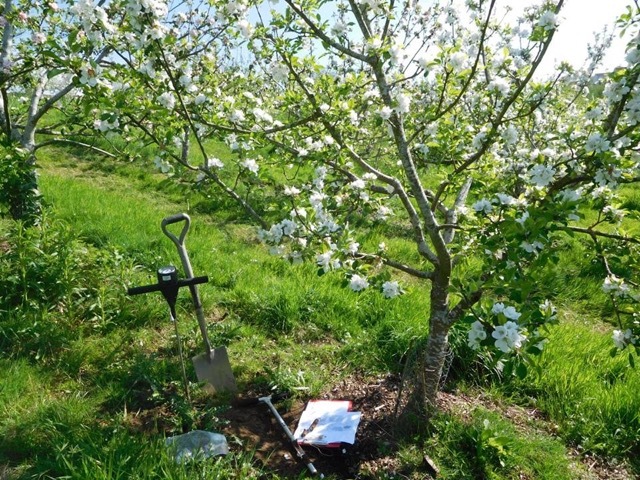 Over the last twelve months we have put in place a series of soil and plant tests and taken baseline data. We are testing for pH, salinity, conductivity, a wide range of trace elements and also available nitrogen. 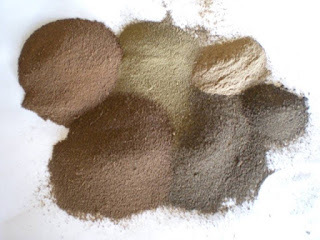 In addition to this, we are developing a high quality range of preparations and techniques such as biofertilisers, aerobic teas, mineral chelations, mychorriza, chromatography, lactic acid bacteria, and native microorganism reproduction among other methods…. The objective of this practice is to reproduce the local microbiology, as bacteria, actinomycetes, fungi, algae and protozoa working in a complete harmony in a healthy environmental system (forest, farm or even animal and human system). Whilst it is tempting to try to produce a range of products for sale, we are wary of claims that certain microbe mixes are ‘silver bullets’ to be used in the same way as chemical fertilisers or herbicides. We believe it is more important to get a good understanding of the science behind this approach, and then for farmers to tweak them into individual requirements or situations, thereby having a positive impact on the farmer´s autonomy and viability and hopefully reaching a broader scale. An example of how we can work through these preparations can be seen at Ragmans currently. We have in the past sampled our soils and found them lacking in certain trace elements. A conversation with any good soil lab will furnish you with the trace elements needed, normally in the form of salts – magnesium sulphate etc. These are supplied and put out onto the land with a spreader. The addition of trace elements in this way can be ineffective as both the soil and plant are looking for elements in a bioactive form – ie easily digestible. For this reason sometimes the addition of trace elements can be disruptive and almost always there is waste. When we make biofertiliser on the farm we build a biologically active system using fresh cow manure that has the gut flora and fauna of a ruminant. To this we add various ingredients – including molasses, yeast, native microbes from the forest soil. A ferment takes place into which we can place trace elements in minute quantities over a period of three or four months. 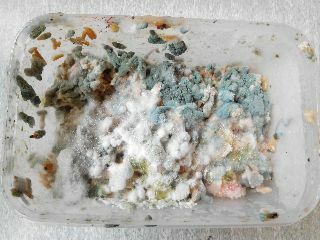 These minerals are cycled through countless generations of microbes becoming more and more biologically available. When the preparation is ready we spray onto the leaves and soil thereby feeding the system through the plants that in turn will feed soil microbes with essential micro nutrients. This is a basic example of our approach as taught by Jairo Restrepo. We are only beginning to understand the potential of natural agriculture, and there is very little knowledge at all of this work in temperate systems. We are also running a six day course with Jairo at Ragmans from June 29th to July 4th 2017. Jairo's book 'The ABC of Organic Agriculture' is now available in English from our on-line shop. I would like to introduce this thought with a simple and easy question comparing two different well known similar tools, but with different final purposes, just to put this article in context... it would be something like this: What is the right choice If we have to choose between digging a trench or making a swale? I can think a set of possible answers straight away...but the most important and relevant in here would be: it depends... we can say that both are similar in terms of how to do it, similar shape and both are linked to water; but in the end, the purpose, also the results are quite different; but both are quite important depending on several key factors (climate, landform, purpose,...) and also they are quite opposite. Therefore, if we follow on with the same philosophy and perspective in the field of brews when we are dealing with microbes, and also the processes to multiply them (here we can mention the most well known ones, such as aerobic and anaerobic processes); which one do you suppose would be the right one to develop and use on our land? We could think about the answer from the following perspective: what is the final product like and what´s going on in either process. I think we will understand it better after considering the few points below. Right!! It is well known that a trench conducts water and a swale stores water, so we are dealing with a kind of “equation” where we already know what we want to achieve for our land and what the effect of doing one or the other will have on the land. We understand the process and the results; but, using again the example of making brews, what does each process (aerobic/anaerobic) satisfy in the end? What parameters in this equation we will have to think about (cause-ingredients- process-product-effect)? As a general concept in both processes, aerobic and anaerobic brews, we can say that the main goal of both methods is to extract and multiply a set of beneficial microorganisms into a liquid brew to use on the plant tissues and soil to encourage fertility on/in the system (soil-plant-human beings). I would like to stop here and look in depth into the concept just exposed: what do we mean by beneficial microorganisms? At this point we have to be humble and think how much we know currently about these little friends who are living everywhere, even inside us!! (In a ratio between 90-99: 10-1 (microbes: cells)). Here there is a possible paradigm within our simplistic way of seeing how nature works. But, do we really know how accurate microbe classification and behaviours are under our limited knowledge and understanding?? At this point if I make a brief overall description about “microbe behaviours” to date, we can split it into innumerable groups depending on several factors beyond aerobic/anaerobic. Some of them would be: nutritional carbons uptake (autotrophs, heterotrophs), energy resource requirements (photoautotrophs, chemoheterotrophs), ways of acting (syntropic, anthropic), also range of temperature (psycrophiles, mesophile, thermophilic), range of pH... among many other groups; we can even identify them by functional group or their niches in nature. Then, so far we can see a classification beyond just aerobic-anaerobic or “beneficial-pathogens”. I think it is important to add another group to this huge classification; the FACULTATIVE ones. To me this is the most relevant one, and the most important aspect would be how this group is linked with all the groups mentioned above. The facultative group (it could be the most predominant or relevant one playing a key role in our equation) means that they perform their functions depending on what group, behavior, etc (e.g. above) are predominant at that time, conditions, etc., and then are supported by the facultative group. (We can compare this group with the behavior of human beings and we can see similarities between them, which prove again that we are almost made up of a diversity of microbes! And not just structurally speaking, but also regarding our behaviour). So, after all the points previously mentioned I think we are a bit more ready to discuss brews, processes, final products and their purposes without going into detail or highlighting one or another process. 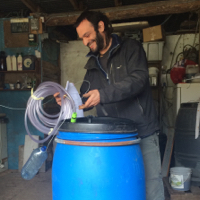 There are lots of discussions going on about the uses of AACT (Aerated Activated Compost Teas) or biofertilisers (fermented brews), regarding one or another, but well beyond this debate and looking at their own aspects, to me the right question would be: When, for what purpose, why and how should we use one or the other?? How can we dismiss the importance of fermented processes in life? Are we denying the importance and goodness of some microbial fermented processes in the soil? Even its importance in metabolism within the human body or in some products such as wine, yoghurt and cheese or different types of food in our daily diet? Why do we have to choose between multiple millions of microbes in one way or another? Even knowing that aerated microbes often can replace oxygen in anaerobic conditions and use other nutrients instead; or that anaerated microbes can hide between water molecules? 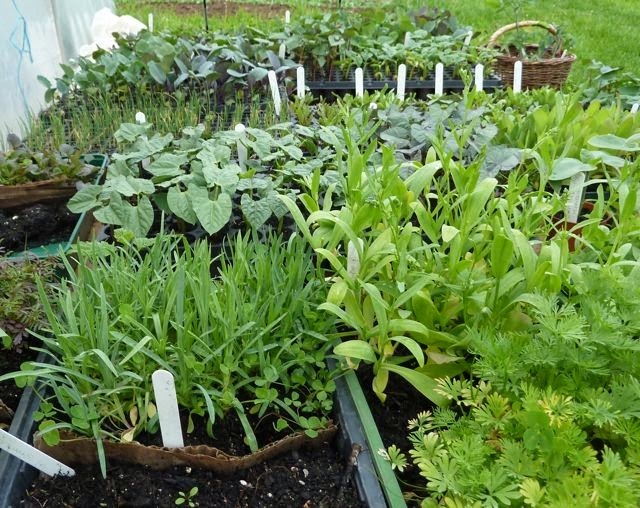 Therefore I can simply say that how, why, and which one to choose will depend on several factors, such as origin and quality of ingredients, soil and plant conditions or the goals that we wish to obtain in our system, dealing with the wide range of factors in our equation. Columbian champion of Organic Farming and for the rights of small holder farmers. "my dream is to construct a being, an ideal state of a being, so that I shall not be the ideal being of the State". 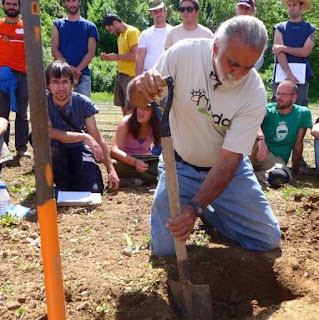 Jairo Restrepo is a passionate educator and activist in the field of sustainable agriculture and food sovereignty. He campaigns for a return of self determination, knowledge and autonomy to the farmer away from the power of agribusiness. He offers education, agronomy and consultancy around the world. His background is in Latin America and recently he has been touring in Europe and Australia. Jairo used to be consultant to the UN, Unesco, and the International Labour Organisation. 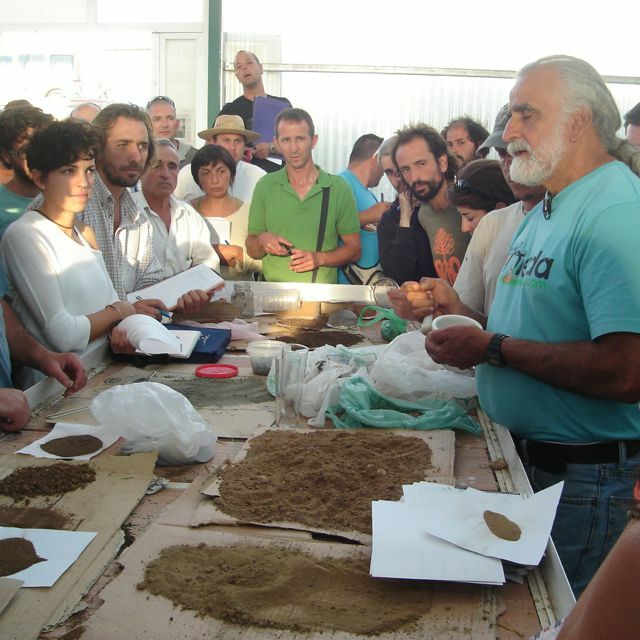 As an advocate for Agroecology and regenerative farming, he is unique in that he not only argues passionately for the rights of farmers, but he also offers an array of practical technologies and preparations to increase soil fertility and transform cropping. He offers tools and inspiration for farmers, smallholders and activists. 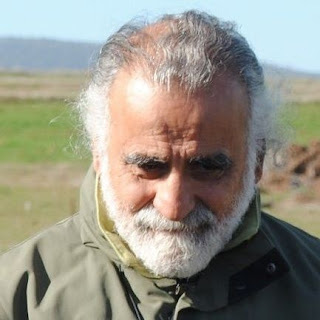 An agronomist with a rebellious character, he has a passionate belief in people power, in local rural culture, food sovereignty, and the desire to transmit the indigenous knowledge and experience gathered from over 20 years work across all continents. In this interview he speaks of organic farming although he is mistrustful of certified organic farming in the context of South America. 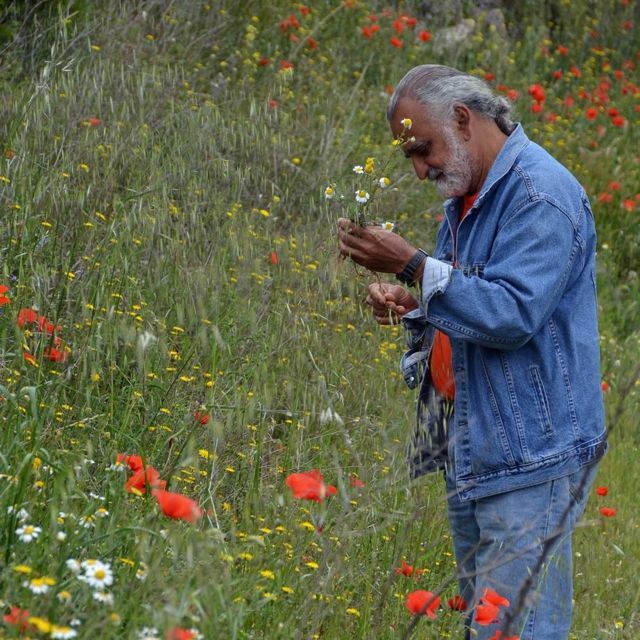 His brand of organic farming is closer to Regenerative agriculture. JF – Tell us a little about your background and how you came to work in organic agriculture? Jairo – I worked at the Federal University of Rio Grande de Sul in Brazil for many years. My main work was in the analysis and development of agricultural pesticides. For instance I was researching how to eradicate the smell of rotten eggs from a phosphoric poison called Malatol used in corn and wheat storage. However, in 1979 I happened to hear a talk given by a professor working in the poison residues lab on the Ministry of Agriculture. His name was Sebastián Pinheiro and in 45 minutes he was able to describe how agricultural poisons were used not only in the environment, but also how the industry was born out of the second world war, and that it was now bribing the entire structure of the Brazilian Dictatorship. This was a turning point for me. I became very self critical and aligned myself with Pinheiro. Working with him, I trained in chemical residue analysis, and then I started speaking out to defend and protect life. My mission now is to defend life. This is my purpose, my instinct, but also to protect the conditions that encourage perpetual and healthy life. JF – how did your work have impact in South America? It is hard to quantify it – many things in Latin America happened due to the crisis or terror and rising social tension. So there is resistance and re-existence. When I speak of re-existence I speak of people who have always found a way without industrial agriculture. Some farmers have access to industrial technology, other have not. But the changes are huge. 75% of farmers in Latin America are now using organic fertilizer in one way or another and they produce 67% of food in Latin America, mostly in the small farmer sector. When we started promoting the proposal of organic agriculture in Cuba, in 10 years we were linked with 87,500 promoters of organic agriculture. From 1997 up to 2007 where a 10 year programme was concluded and assessment in Havana was performed, we recognised that this movement grew due to the interest of many farmers, so we did have a huge impact. I participated in forming the founding of the movement in Cuba and made several consecutive volunteer trips from place to place throughout the country. One of my trips lasted 78 days, and we were in contact with 3,000 Cuban technicians - this practically became policy. Ideas are shared through farmer to farmer learning. But organic agriculture is not a small farmer unit, it is not even a broader political proposal; it is broader than that. Organic agriculture goes from being an instrument of technological transformation to an instrument for transforming society. Society does not have to be detached from technology. Technology is an expression of society and this is what we want. We don’t want to change technology; we want to transform society, thereby changing the technological proposal. Today the opposite occurs, the dominant type of technology proposes a society subjugated to industry, and we want the opposite and here I use one sentence quite a lot... "my dream is to construct a being, an ideal state of a being, so that I shall not be the ideal being of the State".I want to fight for this ideal state of being so that I won’t be the ideal of the State; that is not to be slavish. Industrial agriculture is no longer able to respond to the crisis of societal change. On the contrary it is causing the crisis, because agriculture and the food system wants to enslave society, concentrating economic revenues. This hungry proposal of accumulating capital by all means causes a crisis, and farmers see that this is not a technological issue but an economic crisis that in turn is a political crisis. Capitalism is its own gravedigger in this respect. JF - What are the obstacles facing organic agriculture? There are three obstacles. The first is the State. It has little societal commitment and no desire to change. Industry is where the power lies, and politicians are temporary. In Latin America industry is power and politicians are temporarily there as its representatives. The second obstacle is the monolithic approach of Universities. The term University is derived from "universities", the universal set of knowledge possible to dream up, construct, and propose a thesis. Today Universities don’t propose theses, they propose ‘research’ but already know the results. This is adjusted research. Industry does not need universities for knowledge, as they conduct more research themselves, what they need is legitimacy. People have an idea that university is "free, public and serves the people". That’s a lie, the university doesn’t represent the citizenry, more so, if universities were to close farmers wouldn’t even notice, the social impact of universities is negligible as compared to farmers. People think that Universities are prestigious; this is still the image that is maintained, like a veil. The truth is that the University is a brothel, where knowledge and technology are prostituted. The third obstacle is rural outreach, the system for disseminating information to farmers. It has been created on a lie. It assumes farmers as a technological consumer unit rather than as a cultural entity. The agricultural supply industry can sell products through operatives that need very little training – you don’t need to be an agronomist, to be a mugger you don’t need to go to college. 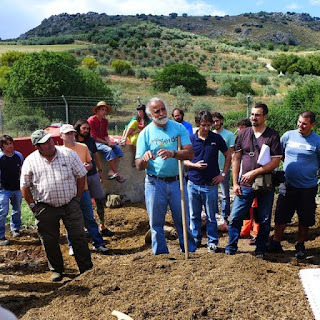 Organic agriculture is about rural communication, where discussion and dialogue is held, where the farmer is recognized as having something to give, as they know the territory. The farmer provides the context and the background, and then others coming in can see the potential or possibilities. This is the basis for developing organic agriculture where both parties can grow together. JF – Can you tell me about the impact of your work on climate change? 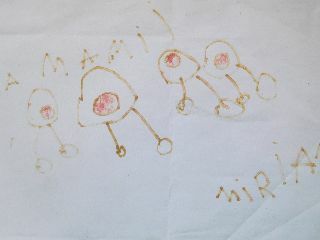 Jairo - Its very simple. The more we can build life in the soil, the less carbon will be in the atmosphere. So for example the herbicide industry should pay for carbon emissions, not only for killing life but also in the embodied oil within the product itself. Fungicides greatly modify the climate, why? Because they are selective and modify the food networks connecting microbiology and decomposition. When decomposition of organic matter is paralysed and modified this releases more carbon. On the other hand the proposal of organic agriculture is to increase soil life and to trap carbon within productive systems. JF – You have worked for the United Nations. They have proclaimed this year the year of the Soil. What do you think of this? Jairo – They have a year for everything. Saying it’s the year of the Soil is like saying its International Life Year! Every single day humanity is related to soil. Our stomach does not exist without being tied to the soil – without soil there is no life, so why have one year that is for soil? Its madness. Being back in Holland made me realise how amazing my time at Ragmans had been. While cycling through the Dutch landscape (which is not very impressive compared to the beautiful Wye Valley Ragmans is surrounded by) I notice myself pointing out different weeds growing in the fields. This is something I did not even look at before I started working on the farm. Not only the weeds are keeping me busy; realising the importance and purity of nature was something I just took for granted before. As a second year student of International Development Management I had to learn more about farming. 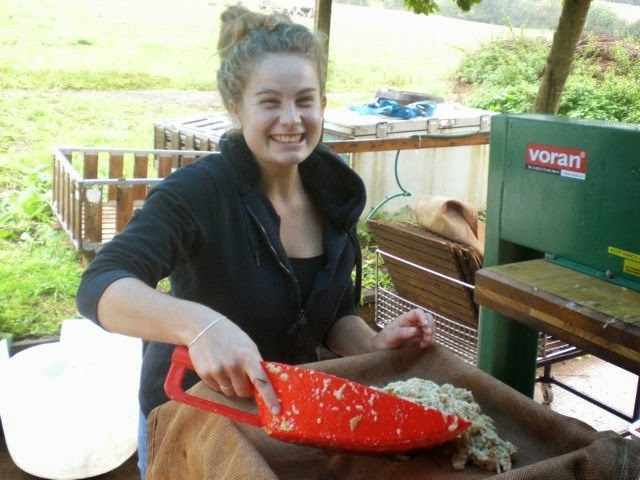 So I spent weeks and weeks trying to find the right placement place or WWOOF farm. There were two things I knew before I started searching: I wanted to learn more about permaculture and I wanted to go to the UK. I Googled ‘permaculture farm in UK’ and found Ragmans. I knew immediately that this was the place where I wanted to go. In the first week on the farm it became clear this was exactly what I needed. In the time between my first working day on the farm, which was the 14th of July, and the last one, 10 weeks later, each and every day was different. The weather, jobs, and people all made my days interesting and worthwhile. Freya, Pete, Matt, and Juan Fran supported me along the way and gave me many opportunities. They gave me space to learn as much as possible about each and every aspect of the farm. 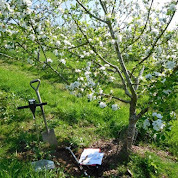 From scything the orchard to compost-tea’ing the apple trees, stacking wood, preparing the Yurt, to organising a Gathering of Centres on the farm. Their trust in me made me feel so much more confident. 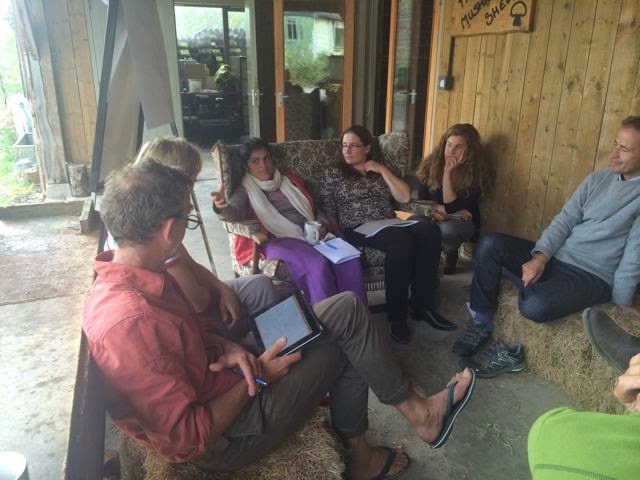 Whenever I had a difficult permaculture question they were always willing to give me an answer and tell me even more about it. It felt like I had been there for ages already. They all create such a warm and welcoming atmosphere within the farm! As part of an individual placement assignment I was involved in organising a Gathering of Centres. A two day meet up to exchange experiences between 9 other educational farms in the UK. It was amazing to see how people with the same interests and concerns had the opportunity to share knowledge. I had never thought an event like this could be so supportive and helpful. This gathering was a great opportunity for me to meet other inspiring people and become more involved in ‘interesting sustainable things’ going on in the UK. Something Holland can learn a lot from! It is hard for me to draw up a list of all the things I learnt during my time at the farm because it is endless. Working with the Growers proved a very valuable experience as well. 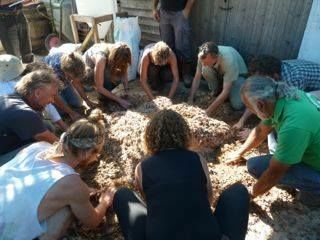 The alternation of working on Ragmans for 4 days a week and one day in the Growers garden was perfect. Nat, Danny, Ben, and Jon taught me so many things about veggies, soil, equipment, seeds during the days I worked with them. I never knew I would develop a serious interest and see the importance and value of growing local food and flowers. Even though Ragmans is quite isolated, having warm, helpful, and lovely people around me made me feel at home. Thank you Freya, Matt, Pete, Angie, Ann, Steve, Carine, Juan Fran, Nat, Jon, Danny, and Ben. The work you all do is amazing and you are all amazing! You know what they say about people visiting Ragmans once, don’t you? They all return in due time. Well, don’t worry, I will be back for sure!